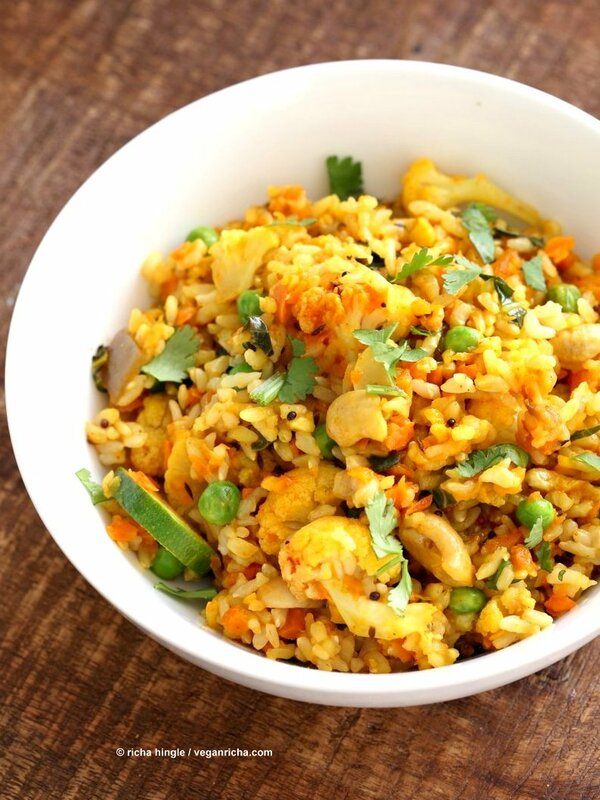 Vegetable Carrot Fried Rice with Indian spices and shredded Carrots. 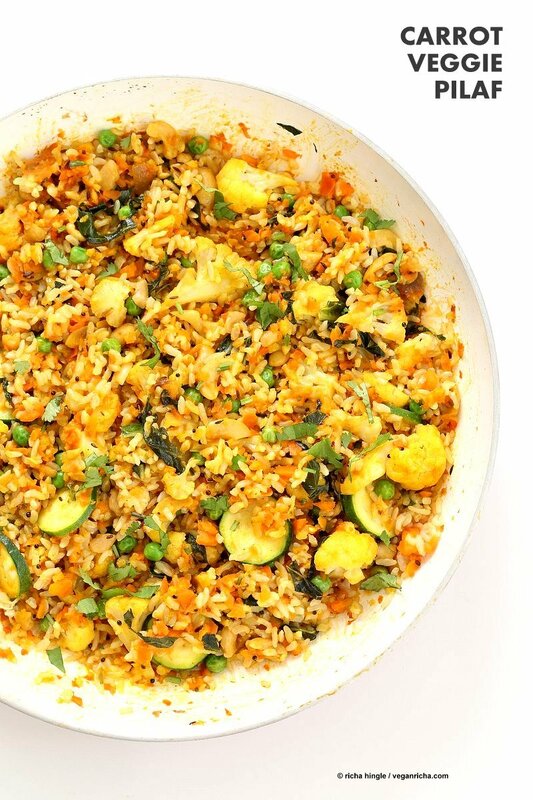 30 minute Carrot Veggie Brown Rice Pilaf. Colorful flavorful side for Easter or Holidays. Vegan Glutenfree Soyfree Recipe. Pin this Recipe! Spring is in the air. Seriously it is. Sneezing and watery eyes all around. Easter calls for a load of sweet carrot stuff. For a change, make this savory carrot pilaf! 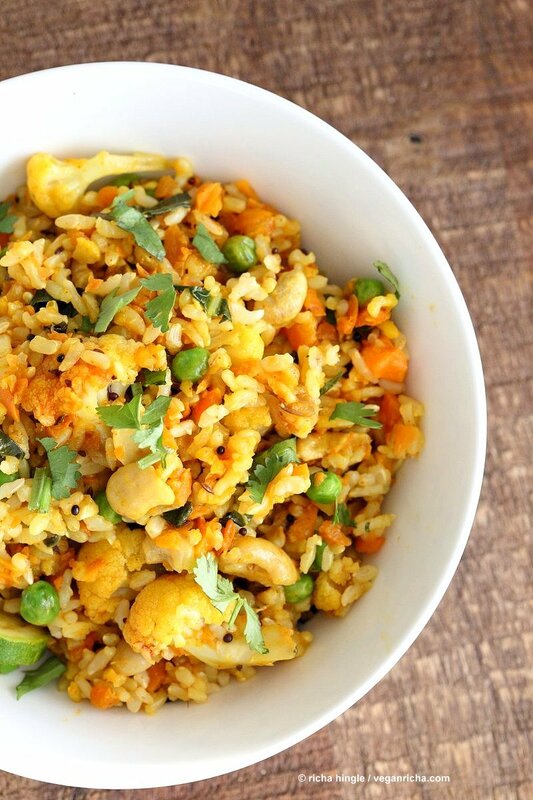 This spiced Indian style fried rice has toasted nuts, veggies, spices of course, and grated carrots. The grated carrots look like orange rice grains and look super pretty. Use chopped carrots for quicker. Use any spices you have and add herbs and flavor of choice. This rice can be served by itself with a dash of lemon or chutney/dressing or served as a side pilaf with curries, or gravy. I use brown rice in the pilaf, use any rice or other cooked grains of choice. I have this thing with most brown rice. a- It just doesn’t sit well with my tummy, and b- seems to overpower the dish. I mean the flavors disappear by the time one is done chewing the darn rice! Thankfully, I did not let that get in the way of trying my own ways to use brown rice. I prefer Brown Basmati (long or short grain) rice. It cooks faster and softer. 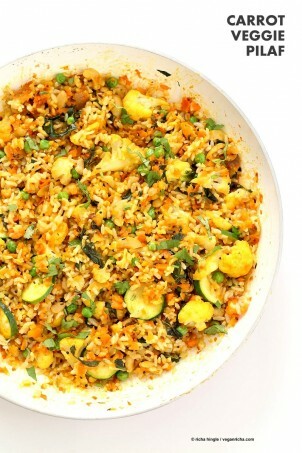 Well cooked and well spiced like this pilaf and you will be in love. 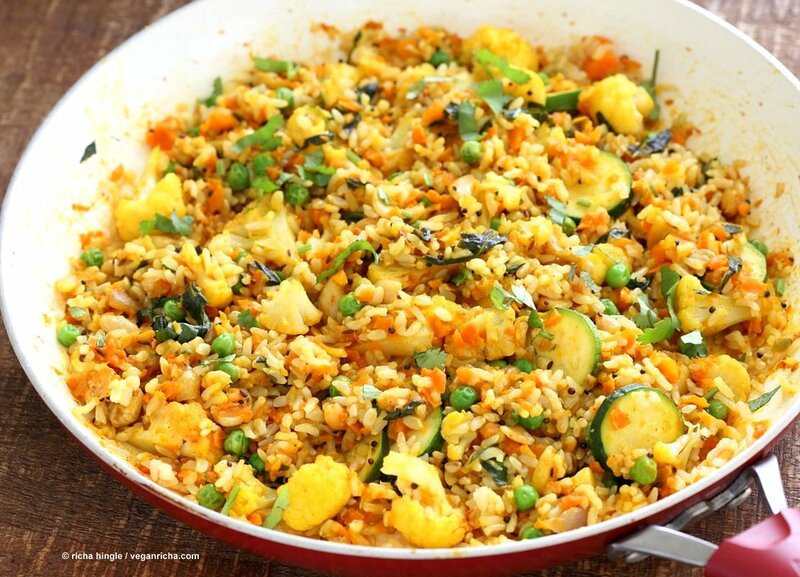 Vegetable Carrot Fried Rice with Indian spices. 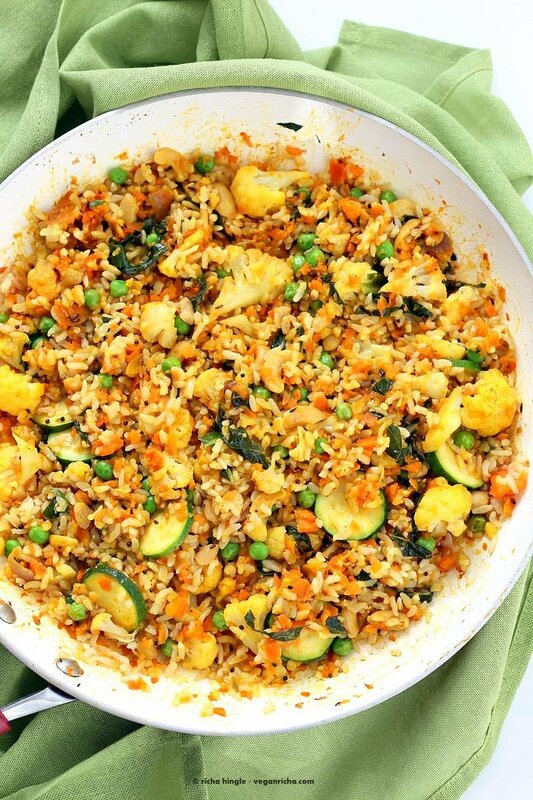 Carrot Veggie Brown Rice Pilaf. Colorful flavorful side for Easter or Holidays. Vegan Glutenfree Soyfree Recipe. Add more Peas or chickpeas to make this a full meal. 1/4 cup chopped raw cashews or other nuts. Dry roast the nuts on a skillet until lightly golden and set aside. Heat oil in a large skillet over medium heat. when the oil is hot, add cumin and mustard seeds and let them cook until they change color considerably or start to pop. Add the curry leaves, onion, garlic, ginger, chili and pinch of salt. Cook for 3 to 4 minutes or until translucent. Add the cauliflower and mix. cover and cook for 5 minutes. Add the carrots and a splash of water. Cover and cook for 3 minutes. Add the spices and mix in for a few seconds. Add the greens and veggies, ketchup and a splash of water. Cover and cook for 4 to 5 minutes or until the cauliflower is cooked al dente or to preference. .
Add the cooked rice, salt and roasted nuts and toss well. Taste and adjust salt and heat. Add more salt and cayenne if needed. Reduce heat to low. Cover and cook for 5 minutes. Garnish with a liberal drizzle of lemon juice, some garam masala and cilantro and serve. Serve as is , or with dal, curries or a drizzle of avocado cream (blended avocado lemon cilantro salt and pepper), or with mint chutney. Use peeled and grated fresh Turmeric root instead of some of the carrots for variation. The Life of Tillikum the Whale: For 30 years, Tilikum has been committed to an asylum of despair and deprivation. In Victoria, Tilikum was placed in a 100-by-50-foot pool only 35-feet deep, trained with food deprivation techniques. Forced to do eight shows a day, seven days a week, Tilikum developed stomach ulcers at a very young age. She is nearing the end of her tragic life because of chronic health issues. Looks delicious! I love carrots and all of the vegetables you included in this rice! Thanks! Loads of spring veggies and carrots. This looks lovely, definitely one to try. You’ve converted me to cumin seeds, they have a more complex flavour than the powder, especially toasted first. The only problem is as my spice collection is growing it has taken over a whole cupboard in my kitchen! I think not all brown rice is the same, there are some brands I like and some that are just chewy cardboard. In the UK at least the Traidcraft brown rice is my preferred brand, I get it mail order if I can’t get it in the shops. With the added benefit of being fairly traded. Yes its like any rice. Many varieties. The fat brown or dark brown or brown jasmine rice doesnt go well with me at all. Awesome! you should freeze the curry leaves and use them frozen. The flavor is much stronger that way. The frozen leaves stay good for 6 to 8 months! Richa! We made this again and my daughter and I cannot get over your brilliance with spices. This is so flavorful and layered. Gorgeous! Hope you are doing well. Havent seen you on the blog for a while, so thought to check. This was delicious! I doubled up on the cauliflower as the ‘extra veggie’ and may have doubled up on the cashews because I love them. BF loved it too and I got to use some garden veggies. Thanks! This is a wonderful recipe!! I only found your blog yesterday (via Pinterest) and all of your recipes looked really tempting. I bulked up some of the quantities as my son has a huge appetite.I asked him how any stars out of five he would award it and he said five….I do too!My son said that the aroma of the spices on the plate when I handed it to him was wonderful. Looking forward to trying more of your recipes. Awesome! I am so glad to hear that!! I make this regularly. It’s delicious and relatively easy especially if leftover rice is on hand. I vary the veggies here and there depending on what I have. It’s a great end of the week meal to use up vegetables. I usually kick up the spice a bit unless I’m cooking for friends. The spices are a must. you speak my language! more spices the better. This is so delicious and colorful. The perfect way to use up the cauliflower and veggie odds and ends. Thanks! Its a favorite in our house too. variations every other week. I made this for dinner and it was absolutely amazing (I didn’t have ketchup, and replaced it with a couple canned tomatoes). This is going with my favorites. My only regret is that your recipes are only for two people (very generous portions, though), when I would have liked to eat this for 2 or 3 days in a row! Any idea how to adjust the spices if I double (or triple) the other quantities? I think maybe only 1 and 1/2 times instead of 2, but I am not too sure! I love Indian cooking and I am also trying to become completely vegan, so I am thrilled having stumbled about your fantastic blog. Thank you! I would double most of the spices except the heat like cayenne, black pepper etc. Those you can start with 1.5 times and add more later. Which Brown rice brand do you recommend? Love this recipe! Very adaptable. I just use whatever veggies I happen to have on hand and it always turns out delicious!